We are taking part in 2 hunts this February - and steering clear, mostly, of the obvious theme! 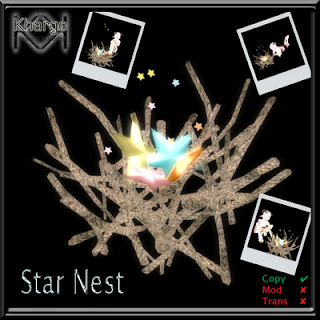 The Star Nest is a whimsical item with 3 spots to sit and gaze at the baby stars. The starry particles go on and off on touch. Starry Nites is a smallish hunt with 21 stores so set off now to catch those falling stars and put them in your pocket! Starting point is here (it's us!) and the blog is here. Home for Two Hunt has a furniture and home items theme. Our prize for this hunt is the Coffee Time chair and tray table. Home for 2 Hunt has 30 stores, the blog is here and the start point is here. 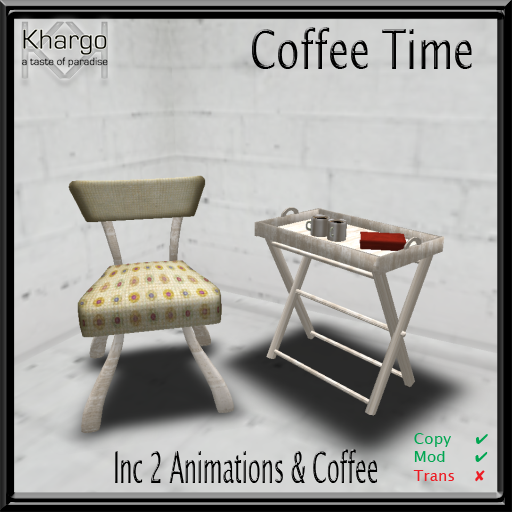 Khargo: Tip Jars - Meep Meep!